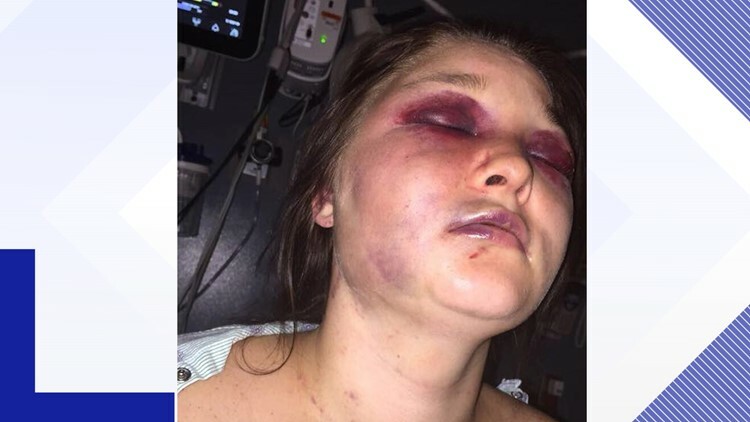 Columbia, SC (WLTX) — A Richland County man is under arrest after the father of the victim posted images of his badly beaten and bruised daughter on Facebook. Richland County Sheriff's Department's Fugitive Team and US Marshals arrested Spenser Mackenzie Jeffcoat, 21, and charged him with attempted murder, domestic violence high and aggravated nature, and kidnapping for the assault that occurred on Saturday, Nov. 10. Deputies were called to Palmetto Richland Hospital around 4:30 p.m. Saturday. The victim was able to speak with the deputies who said she was kicked, punched, and strangled multiple times by Jeffcoat. The victim had to undergo surgery and was treated for multiple injuries sustained to her face and body. The victim's father took to Facebook, posting pictures of his daughter's injuries and photos of Jeffcoat. The post was shared over 14,600 times as of Wednesday. A photo posted to Facebook by the victim's father. Susan Barber is the executive director of the South Carolina Coalition Against Domestic Violence and Sexual Assault. She say's it hard to see the images that are a result of domestic violence. "I think whenever you see a depictions of those kinds of injuries, it's horrifying. It really makes a stark reminder of what can happen as a result of violence within a relationship," said Barber. Barber says South Carolina has a bad history of domestic violence cases. "The violence policy center has been releasing reports when women have been killed by men. South Carolina has been in the top 10 every year. This year we were sixth. We've been number one three times," explained Barber. She says this case is interesting just in the fact that the victim's father shard the post on Facebook. Barber thinks if you're thinking about going to social media to help a victim of domestic violence, you should keep their interest at heart first. "Whenever it comes to anybody's personal information, and there's nothing really any more personal than being assaulted by somebody that you're in a relationship with, we really urge that the wishes of the victim be respected and it should be paramount to everybody involved," said Barber. Barbers says South Carolina ranked lower this year when it comes to the number of deaths of women caused by men but the number of fatalities have risen to 48.